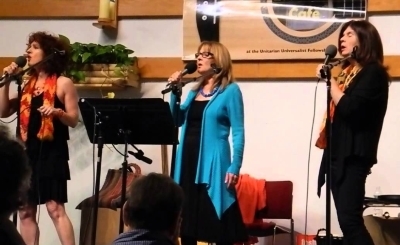 Wild Ginger & Mountain Maidens - Friday, May 10 - 8:00 p.m.
Wild Ginger – this female vocal trio – Candice Baranello, Caren Jacobs and Maureen Keelty – create exquisite harmonies using contemporary and traditional ballads, paving new roads between musicology and pure entertainment. With their taut three-part harmonies and counterpoint vocals in a variety of the world’s languages, Wild Ginger celebrates the unbounded possibilities of the human voice in the spirit of joy; unity and change. 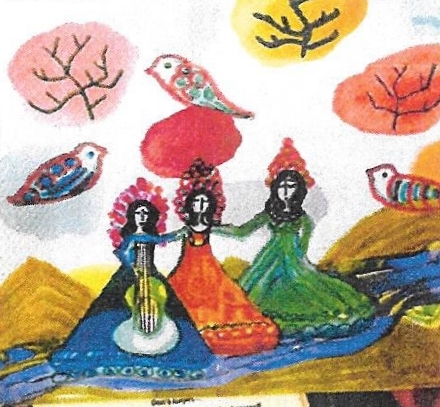 Mountain Maidens is Marie Mularczyk, Candice Baranello, Lorraine Berger, three dynamic voices blended in splendid ancient and modern harmonies that will lift your spirit, excite your senses and warm your heart. They sing ballads, folk songs, Medieval, Irish Traditional music, love songs, country and gospel songs including themes of social justice to the accompaniment of guitars, banjo, dulcimer, bouzouki, dumbec, spoon castanets and lots of percussion instruments including washboard. The Grounds & Sounds Café features the best in live acoustic music in a casual, comfortable atmosphere. Enjoy gourmet coffee, pastries and desserts. Bring a bottle of wine and we’ll pour it for you (small fee) – fruit and cheese plates are available, too.